If the Bharatiya Janata Party (BJP) has to bevisualised as a plant, it can best be thought of as a lithe, fast-growing climber that seeks nourishment from the body of an older, big ger, rooted ally, which is part of the local flora. But unlike the climbers of the plant world, the BJP as a political entity replaces its older partner so completely that it doesn't leave a trace of the original body on which it grew. 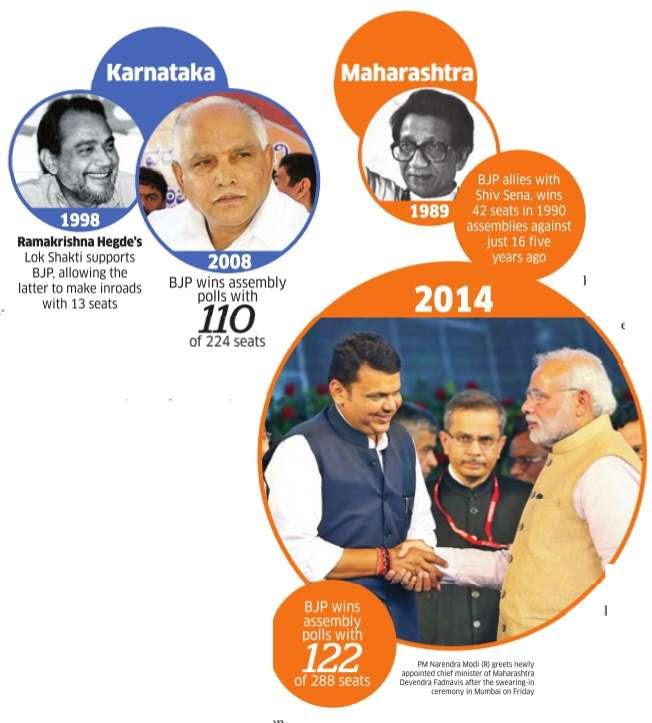 The first BJP government in Maharashtra is being touted as Prime Minister Narendra Modi's personal achievement.But is the Maharashtra victory due only to Modi's strategic vision and Amit Shah's tactical brilliance or is there a pattern to the BJP's growth across the country, riding piggy-back on local allies? Now, it is difficult to imagine Guja rat as a non-Hindutva state. But in the 1971 Parliamentary polls, Congress (O) had about 10 seats, the Swatantra Party one in Gujarat and the Rashtriya Swayamsevak Sangh's (RSS) political outfit, Jana Sangh, had none. Around that time, one of the significant victories against the Congress from Gujarat was that of Maniben Patel, the daughter of Sardar Vallabhai Patel. De spite contesting against Congress, she was not part of Jana Sangh. The RSS grew as a political entity primarily during the days of the Emergency, bringing all the right-wing forces -its own Jana Sangh, the feudal lords' Swatantra Par ty, the right wing within the Congress, the Con gress (O), and the Socialist bloc -together on the sin gle platform of the new Janata Party. It borrowed the election symbol of Charan Singh's Bharatiya Lok Dal and swept the 1977 Lok Sabha polls. But when the Janata Party split and the BJP was formed in 1980, there was no Swatantra Party or Congress (O). Instead, the BJP became a bigger entity occupying their space in states where these two parties dominated. After the Ja nata experiment, the RSS got its next political fillip when VP Singh led his anti-Congress Janata Dal to victory. The BJP got a share in power in Gujarat for the first time in 1990 along with Janata Dal's Chimanbhai Patel, the chief minister who conceived the Narmada dam, the ports and the power plants of the state. Soon, Janata Dal became a footnote in history and most of the party merged with the BJP in Gujarat, turning a minor player into the dominant political force.Many RSS leaders such as Shankersinh Vaghela, Keshubhai Patel, Suresh Mehta and Narendra Modi contributed to this stupendous task of turning Gujarat saffron. In Rajasthan, too, the Jana Sangh was at best a bit player. The leader of Opposition in the Rajasthan assembly in much of the '60s and the '70s was the state president of the Swatantra Party and the head of the All India Kshatriya Mahasabha, Maharawal Lakshman Singh of Dungarpur. Though Bhairon Singh Shekhawat became the first non-Congress chief minister of Rajasthan in 1977, it still was a Janata Party government. Even in 1990, he could become the chief minister only with the support of Janata Dal. And it was only after the complete assimilation of the remnants of the Janata Dal, Rajasthan's politics became a contest between the Congress and the Bharatiya Janata Party. Another example is Karnataka. The first non-Congress chief minister of the state Ramakrishna Hegde, originally from the Congress (O) stock, had sort of inherited his guru S Nijalingappa's support base among the Lingayats of the state. When Hegde with his Lok Shakti switched sides to support BJP in 1998, the saf fron party made an impressive performance winning about 13 seats. Then, it was just a matter of a few years before it grew in stature to share pow er with Deve Gowda's Janata Dal in 2006 and then to win the assembly polls in 2008. Is not the story of BJP's growth in Maharashtra simi lar? The BJP rode the anti Congress wave in 1989 ac cepting the leadership of Shiv Sena to gain a foothold in the state. Later, it shared power with Sena in 1995 and now it is a bigger party, pri marily because of Sharad Pa war's decision to force a fourcornered contest in the state. Political commentator Kumar Ketkar while agreeing with the Gujarat par allel insists that BJP may not be able to replace its allies to turn Maharashtra into a politically bipolar state like Gujarat, Rajasthan or Karnataka. “Unlike Gujarat, where trade and commerce are the determining factors, Maharashtra is dependent on farming. The BJP does not have the farmers' politics in its DNA. The BJP's success may depend largely on Modi and the longevity of Sharad Pawar's politics,“ said Ketkar. 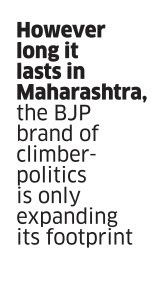 However long it lasts in Maharashtra, the BJP brand of climber-politics is only expanding its footprint. The next fertile stops are West Bengal and Tamil Nadu, where the sisters and mothers of local politics had for long nurtured the saffron seeds.